Photo courtesy of The Center Long Beach. Thousands have seen it float along Ocean Boulevard in every Pride parade since 2000: it’s the massive rainbow flag carried by 80 volunteers each year, with onlookers tossing dollar after dollar onto it in the name of philanthropy. The flag that everyone sees each year, however, has actually been two flags. 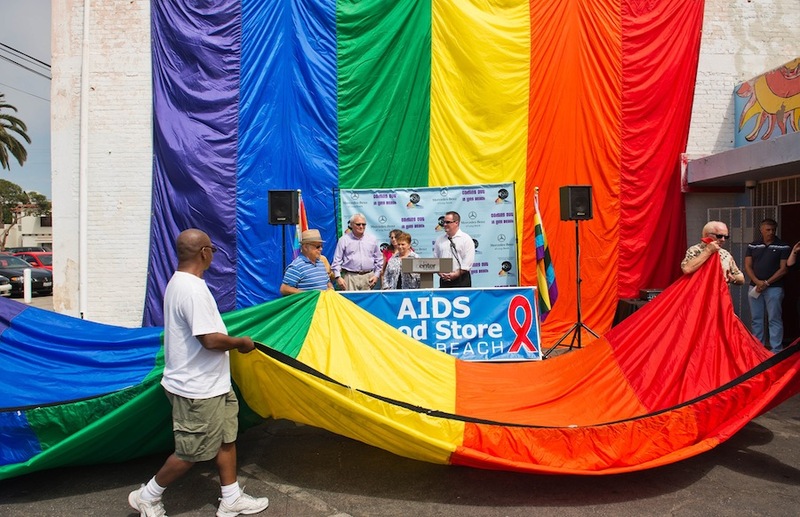 The original one, which was retired in 2003 and now resides at the AIDS Food Store on 10th St., will now be formally archived in celebration of the Historical Society of Long Beach’s LGBT History Project. Pastor Michael Cole of Christ Chapel, back in 2000, wanted the community to become more aware of the issues that the Food Store addressed–and he did so by borrowing the giant flag from an unnamed San Franciscan. In 2003, they purchased the currently used 30- by 80-foot flag by a seamstress residing in the Russian River Valley in Northern California. Since it’s introduction in 2000, the flag has raised some $65,000 and over 800 people have helped carry the giant piece for thirteen years.